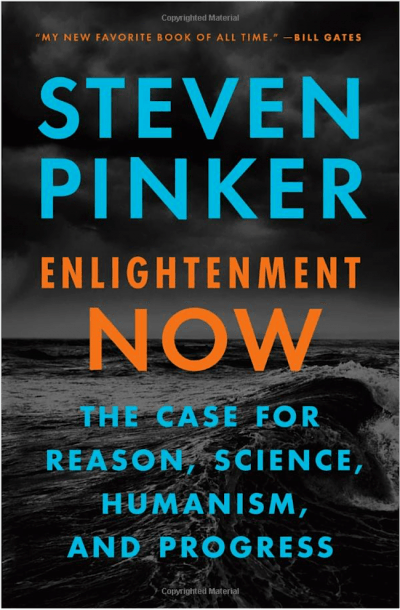 I recently finished Steven Pinker’s Enlightenment Now, which was remarkably well done. I particularly loved the later chapters on science and reason, which talked about how far these have brought our society, and how far they can continue to take us. In general, the book argued—similar to his previous work The Better Angels of Our Nature—that we should be happy because things are just so much better than they used to be. For example, the world happiness report has the United States going from 11th most happy in 2012 to 18th in 2018. I think Pinker is clearly correct about the objective ways in which human society has improved. Unfortunately, that does not equate to happiness or stability in the way that he thinks it does. He does give statistics on happiness in the book, and it’s difficult to argue with the data he provided, but I think those studies are either out of date or were measuring the wrong things. As a case in point, the CDC has reported that the suicide rate has risen by 30% since 1999. That to me indicates a clear drop in happiness. The US is also facing an extraordinary crisis around opioid use, which is killing unbelievable numbers of people. The CDC has overdose deaths from opioids rising from 3% in 2000 to 13% in 2016. But Pinker doesn’t talk about increased suicides, or the opioid crisis, or the destruction of jobs by automation, robots, and AI. In other words, he’s focusing almost completely on the positive. It’s as if he’s collecting evidence to support his belief in how good things are, as opposed to asking if they are good or not. I think Pinker’s fundamental mistake is confusing reasons we could or should be happy with whether we actually are. People didn’t elect Donald Trump because they were happy. People aren’t committing suicide because they’re happy. People aren’t getting on disability in record numbers because they’re happy. They’re doing those things out of emptiness. The country is in the middle of an economic and social revolution, where there is only a top 10%, who benefit from everything in society, and a bottom tier who work mostly service jobs. The middle is being destroyed by progress in the form of automation. And because this automation makes life easier for businesses and customers, it’s being aggressively embraced all over—which is effectively eliminating millions of jobs. The clearest and most complete articulation of this depressing state of the country comes from a book by Andrew Yang, called The War on Normal People. This book is the exact opposite of Pinker’s. It shows how much trouble America is in, and does so with with extreme clarity. It’s basically impossible to go through the first 2/3 of the book and not feel a sense of urgency. 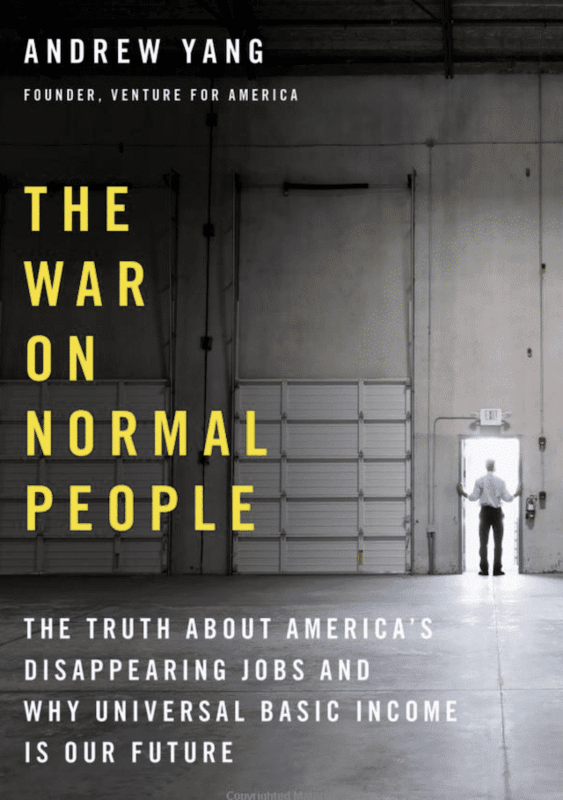 I think Andrew Yang’s book, The War on Normal People, is the most important book in America right now. My piece on the bifurcation of America into Alphas and Betas. Ultimately the message of the book is that we’re heading towards catastrophe. Not a recession. Not a dip. Not a blip. Catastrophe—and one that’s virtually inevitable if we don’t take immediate action. I agree with him, and have been writing about the same thing for a while now. Pinker doesn’t even address these issues. He’s talking about larger scale trends over the course of thousands and hundreds of years. Yes, things have gotten far better at that scale, but that has nothing to do with the crisis we’re currently facing. We’re watching the entire meaning infrastructure in this country be destroyed. As an atheist I think there is a lot of good that comes from discarding religion, but as a humble realist I also need to acknowledge the downsides. Most people will not have a good job or a good paycheck. Being a homemaker is no longer considered meaningful for a lot of parents. So where is the meaning coming from? And that’s why we’re on drugs, committing suicide, and even more scary—electing politicians who will scapegoat others. We’ve directed, starred in, and watched this movie before, and it doesn’t end well. I’m guessing on this percentage, but it seems close. So yes, Pinker’s book was truly fantastic, but I think it represents what he wishes people could understand and realize—not what they actually think about. And when it comes to happiness, that’s what matters. Even the act of processing and accepting the points he makes requires that someone be educated enough to enjoy reading books like this for fun—which filters probably 95% of the population. And those 5% who are reading the book are the ones who need to hear it the least. America is suffering, and no amount of “it used to be much worse” is going to change that. Both books are great, but right now we need Andrew’s a lot more than Steven’s. Sam Harris had Andrew Yang on his podcast, which was great, and that’s how I learned about his work.